The 356 look is distinctly Porsche and still turns heads after 60 years. The first 356 was built in 1948 in a dirt-floored sawmill. 356 production ended in 1965. Its classic styling remains iconic and its silhouette defines the brand. It’s a classic car with a deceptively great ride and surprisingly good handling. The Porsche family applied years of designing fast cars for other companies, and 356s out-handled others because their suspensions were state of the art. Detroit and European cars recycled pre-war concepts because World War II had halted car development. Porsche leap-frogged over them by starting with a blank sheet. You can go fast enough. You can go fast, by 50s standards. Although modern-day transport is better and faster, especially modern Porsches, driving a 356 is a cultural experience not to be missed. You can drive comfortably quick and keep up with most modern machinery. And look a whole lot cooler, too. You can be your own mechanic – they are that simple to fix and maintain. Classic Porsches are almost bullet-proof if set up correctly and maintained by the book. Manuals and DIY help abounds; if you are handy with a wrench, this is a car you can maintain. Owning a 356 is like playing golf – you will spend your whole life perfecting your game. There is no lack of entertainment when you own a 356. When you aren’t driving or cleaning or reading about your car, you will find others approach you to ask questions about or express admiration for your ride. 356s get attention. Organized activities abound for 356 fans. The 356 Registry is one of the most active car clubs in the United States. Separate from the PCA, the Registry has a very active membership of almost 8,000. It has a first-rate monthly magazine, a web presence and online forum, and several club-sponsored activities per year. The 356 World is flush with friends and supporters. 356 owners are worldwide and connect with other Porsche owners, but also with their VW cousins, classic car owners, and even hot rodders. Several online forums incorporate commentary about 356s, and web sites dedicated to the 356 offer a variety of information. Investment-wise, it’s a car that actually increases in value. 356s were produced in fairly high numbers for a sports car, yet their popularity and value continues to drive prices upward on all models. Currently A-model prices are spiking similar to the early 911 phenomenon. Point #9 above corroborates that a lot of people share that view. The 356’s rounded, elegant shape invokes speed and harkens back to the 30s era of aero-style streamlining. European examples include berlinettas from Voisin, Alfa, Lancia, and others. The aero movement strongly affected post-war American design as well. What do You think? Do you have a 356 story to share? Do you have a question about 356s you’d like answered, or a topic you’d like to see discussed? Let us know by commenting below. Having been a 356 owner for nearly 42 years, I agree with Ronald’s comments. I describe them as “little jewels” that bring you great pleasure. It is the only car I know that one can drive at legal speeds and be thrilled with the experience. The level of craftsmanship, fit/finish, and performance is unlike anything else in it’s day. The cars of today are built for ultimate speed instead of the joy of a brisk drive at safe/sane rate with the 356. The other bonus of vintage cars is insurance. Over time, one can almost own a vintage car for free vs the high cost of new performance cars with their stratospheric insurance rates. 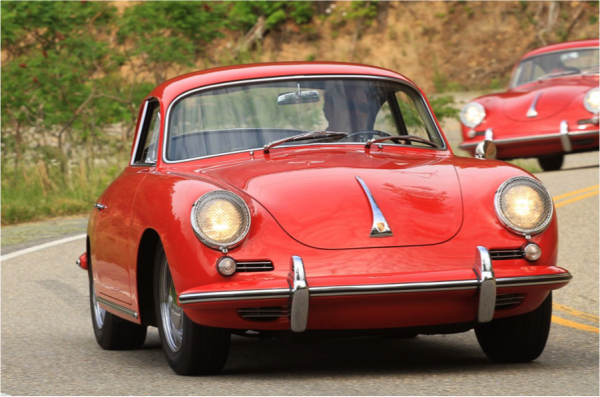 Go drive a 356 and see what you’ve been missing…miles of smiles ! I totally agree with E.A. regarding insurance being inexpensive on these beauties. And taxes too! My 1957 cost me a whopping $36 in taxes last year. I also agree with both, the sound and feed back from a 356 on the road gives the driver a feeling of harmony with the road. The heart of my 1969 912 is the fabulous engine from the 356 Super 90. That’s what I feel and hear on the open road or mountain twisties in the western U.S. Some refer to ’65 to ’69 912s as the “356-D” and I don’t argue with them. Air Cooled Forever! Re: #2: “It’s a classic car with a deceptively great ride and surprisingly good handling. They may have started with a blank sheet, but their “state of the art” suspension was pure 1930’s VW! It does work very well, though, especially on back roads that would rattle a modern car to pieces. My name is Robert Ameteau and I live in France. I have bought a Porsche 356 originaly imported from US 3 years ago. I would like to add few information on your data bases concerning this car and particularly the different owners from the last one on your data bases until me. I think it will be a good things for the next owner to have a full and complete informations concerning this car. how can I contact you ??? Sorry, I was talking about your data base on your website 356a.com. I have owned my 356 for some forty two years. I loved it as much today as the first day I owned it. One problem persists: The back of the drivers seat will not avoid falling away at the most inopportune times. I have tried the Seat Popper Stopper and some other “cures” but none have worked. Any suggestions will be greatly appreciated. This used to happen in our ’73 911 all the time. Finally fixed it by checking the mechanism on the other side of the seat and found it was lubed quite heavily. This meant the seat would stay in position until you shifted your weight and too much stress was put on the inside mechanism (the side closest to the center console/handbrake/hand throttle. Can you give us more info? Have you checked the mechanism on both sides of the seat? From what I understand the Popper Stopper only works for a specific issue and if the plastic cover over the friction cone is still in place the Popper Stopper won’t necessarily work. Thanks for the information. I recently suspected the side of the seat near the console might be the problem. I just tried some repair and do not yet know if its a permanent fix or not. I think this is more likely the problem than the left side of the seat.